This is a reproduction of an original oil painting, Orchard. 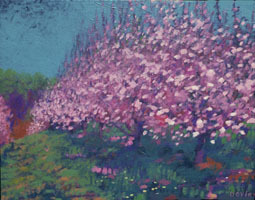 Orchards are great to paint - whole rows of flowering trees! So you get the visual interest and expressiveness of a flowering tree, combined with the geometry of a whole bunch of them together. Plus, the color is great. It's also nice to sit outside on a beautiful day in such a nice place. These trees remind me of Bonnard and Van Gogh, who both painted flowering trees; Van Gogh also painted some olive orchards, with the gnarly tree branches, which are interesting forms to paint. This is a simple painting, but I like the feeling in it - a gentle, sweet feeling, with a small area of intense orange just over the hill, and some dandelions in the foreground.